Now that my knee is feeling much better with daily exercises after intensive physio, I'm spending more and more time without the bulky knee bandage. Which means I can wear my skinny jeans again! Although it's Spring here in Brisbane, it's not always warm enough for bare legs, so I'm pleased to be able to wear all my jeans again and not just my flares. Shortly before my knee injury I wore a simple but colourful outfit with a printed tank, bright cardi and skinny jeans. I really loved that outfit so much, so I've been wearing similar outfits recently. I'm never really sure of the colour on this tank! (Is it pink, coral, red or a mix of them all?!). It was too chilly for bare arms so I was looking for a cardigan to wear with it, and going to pick a plain grey one, when I thought I'd give this brighter red one a try. I haven't worn it in a while. I'm really pleased with the way it turned out, I liked this combination! Cooper has had his 'summer trim' so we took toddler T out to the hairdressers for his first haircut too. He did really well, it helped that the hairdressers were lovely and used to kids. He looks less and less like a little baby every day, he's growing so fast! Last worn: red cardi, striped tank, skinny jeans, studded mouse flats, Rebecca Minkoff Love bag. Other ways to wear: red cardi and a maxi skirt, striped tank with a leather jacket in winter, skinny jeans layered up in winter, studded mouse flats and a maxi dress, Rebecca Minkoff Love bag and printed shorts. 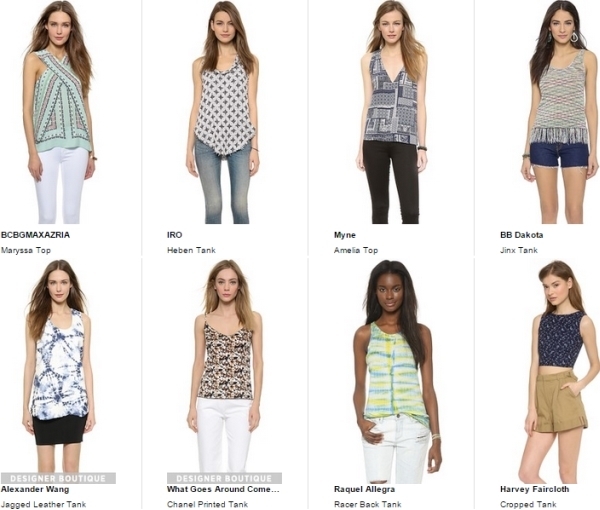 Shopbop have a large selection of tank tops - everything from graphic tanks to plain or printed tanks! They are so easy to layer up when it's cooler or wear on their own when it's warmer. Again, loving the printed cardigan and printed tank combination, so I wore it for a day out with toddler T. We went to the library for toddler time (singing and dancing) and then had morning tea together and did a little bit of running around our local Westfield. Well, he did most of the running, I said sorry to the laughing sales assistants every time he let go of my hand and sprinted into a shop doorway. It's amazing how you can't help but smile at a tiny toddler walking around with the biggest grin on his face, we got lots of chuckles from passers by too. When I'm in a rush, it's impossible, but when I've got nothing on my calendar except spending time with the toddler, it's nice to let him 'explore' a little and to just slow things down to his pace. I'd been looking for something to wear one day and had thought the purple cardi would look nice with this tank, but picked something else to wear instead. It was nice to get around to wearing it, even if I do wish I'd worn a different necklace as this one gets 'lost' a bit in the print. Last worn: Ray-Ban Wayfarers, purple kimono cardigan, Aztec print tank, black prima denim jeans, black ballet flats, Rebecca Minkoff Love bag (above). Other ways to wear: purple cardigan and a maxi skirt, Aztec print tank with a red bag, black skinny jeans and plaid shirt, black ballet flats and a printed dress in the office, Rebecca Minkoff Love bag and a litle red dress. Linking up with Fab Favourites, Fabulous Friday, Flashback Fashion, The Ultimate Rabbit Hole, Modest Monday. Everyone should have a few printed cardis in their closet. I only have two so I should really get a few more. Anyhow, I do love both of your outfits. That red cardi you wore in the first outfit is so well paired with that redish/pinkish coral top...such a stylish combo. I sure do like the colours you used. As for the second outfit, I find that top really interesting, the print is gorgeous. 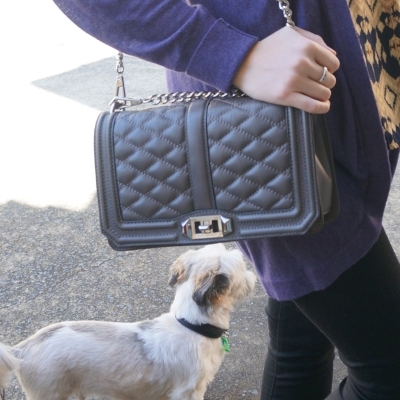 You did well to paired it with a purple cardi, it makes it stand out even more..Plus, that bag is adorable!!! I've been wearing my cardigans a lot more recently, I'm glad they are getting some wear for a change! :) I'm definitely a convert and thing they are good additions to a wardrobe! Love it! The bag is amazing! 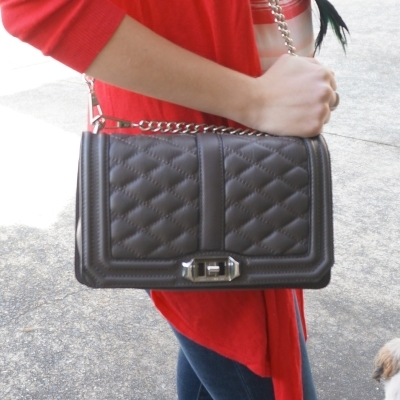 cute looks, love the black bag! He is adorable with his summer hair! Such pretty cardigans... I love the printed tops layered underneath, too!!! HaHa I didn't recognize Cooper! So cute! Glad everything went well at the Barber with baby. GLAD your knee is doing better Mica. Such a tender area. I love both tops and cardis with your skinny jeans. They look great! I think spring colours can look great year round, but I definitely wear darker colours more in autumn! So glad your knee is feeling better! I love your printed tops with the cardigans. Such great layering. The bag looks great in both outfits! So glad your knee is better! That must have been extremely painful. I love these outfits! As a matter of fact, I am wearing a tank-top with a cardigan, and some jeans today! I think that outfits like these are great for spring and fall. You look so beautiful in this last look, purple matches you so well! I love the printed top too! Ugh, not being able to wear what you want because of injuries is the worst! I love your drapey cardigans (I'm all about them this year! ), and you have the best bag collection!! Yes, it's nice being better and having a bit of wardrobe choice! I always love how you put together these colors! Lovely! I am glad your knee is finally feeling better. Must be so annoying having to wear that bulky knee protector for so long! Not to mention not be able to wear your favourite skinny jeans! Mr. Cooper almost made a full frontal appearance in the first picture HAHA I was excited for a second before realsing he was still facing to the side (probably starring at a bird I am sure lol). That red top is so beautiful! Love the bright colour. Glad to hear that you're recovering! Glad to know your knee is getting better and also that you're finally back into your skinny jeans. Your little blogging sidekick is the cutest! I love the print on that second tank - so pretty!! Bright cardigans and tops are perfect for spring! I can see why you've been gravitating towards that lately! And yay for no brace! No one wear the skin jeans & cardi combo better than you. It’s like your signature style. It must feel great to be able to wear skinny jeans again! It is definitely good to be back in my skinny jeans, I missed them, ha! Two great choices of cardigans! Both compliments your tops so nicely! Very cute looks! I definitely really like the first one. Great news about the knee - onwards and upwards. Cooper is looking mighty fine, just like his mommy! I love that red cardi - it really suits you! Love both outfits, but the first one is really eye catching, the red cardi and the tee, beautiful. Love that bag. Your cute dog is so adorable. Cute casual looks! And so glad to hear your knee is on the up and up! I'm glad that your knee is feeling better! Print tops + cardigans are always a good idea. Love the bag too! Stunning outfit! I love your bag! Hi darling! How have you been? Love the bags! Glad your knee is getting better! I love colorful cardigans! The color of the pink/coral/red tank & cardigan is so pretty! Love this bag, now it's on my wish list it's pretty and it will go with everything. 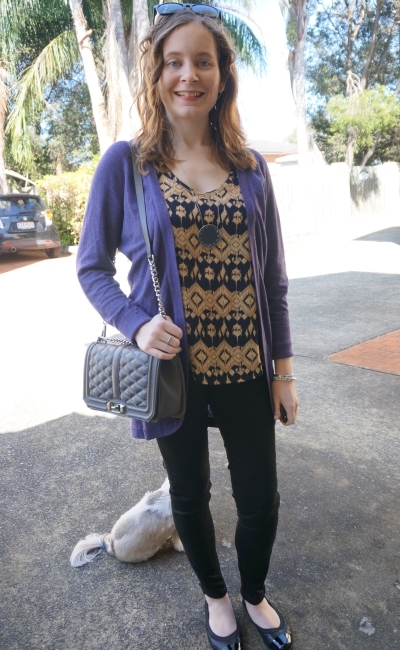 I adore that purple cardigan with the aztec top, for some reason the colours go really nicely together! Also I so wanted to see your pup's face! He rarely looks at the camera now, too busy watching the toddler running around behind the tripod, haha! I'm also always wondering myself how fast our son grows... :)) Your first lovely outfit is looks refreshing, Mica. Both tops are beautiful! They do grow so fast! I love coloured cardigans - I have quite a few and are ideal at this time of year between seasons. Really like the colour of both of yours and great with printed tops. These are both great looks - I just love wearing cardigans. So glad to hear your knee is doing better. That is terrific news!